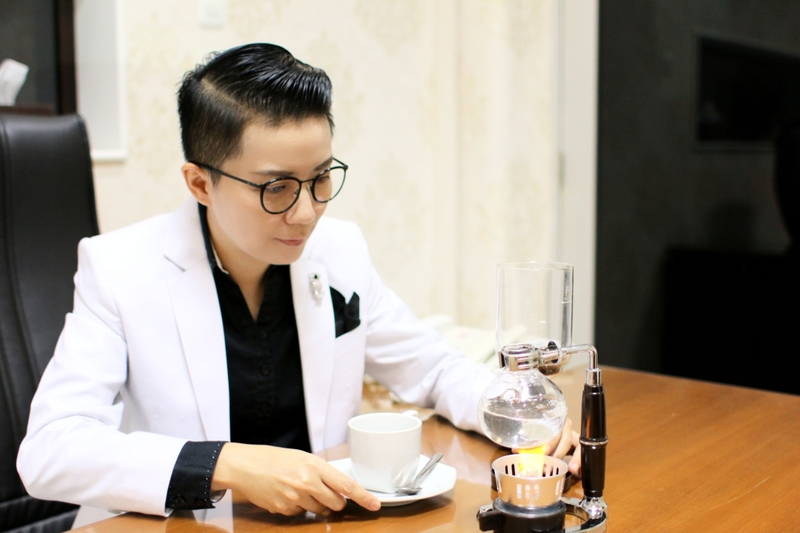 A syphon coffee maker brews coffee using two chambers where vapor pressure and vacuum produce coffee. It was invented by Loeff of Berlin in the 1830s, and after that these devices have been used for more than a century in many parts of the world. Design and composition of the vacuum coffee maker varies. Syphon Coffee produces a bright, sweet, clarified coffee, which is not only involves fully immersion, but also (low) pressure extraction. The process in making Syphon Coffee is somewhat delicate, but produces a cup of coffee that is unique in its richness and clear flavors and can have an oily body, but almost never has any silt. These characteristics are why this method is so famous in many coffee lover. However, the main disadvantage is the difficulty in the process. Anyway, for me coffee is not just ‘coffee’ but the art of making it that make it special. Alat pembuat kopi ala sifon adalah cara membuat kopi dengan dua wadah, dimana tekanan uap dan tabung yang menghasilkan kopi. Alat tersebut ditemukan oleh Loeff of Berlin pada tahun 1830an, dan setelah itu alat ini telah digunakan dibanyak negara selama lebih dari 100 tahun. Alat ini mempunyai desain dan komposisi yang bervariasi. Kopi sifon menghasilkan kopi yang terang, manis dan bening, yang mana tidak hanya kopi tercelup secara sempurna, tetapi juga tekanan penyaringan yang rendah. Proses dalam pembuatan kopi sifon bisa dikatakan agak sulit, tetapi menghasilkan secangkir kopi yang unik dengan cita kaya rasa khas kopi tersebut dan hampir tanpa ampas. Karakteristik inilah yang banyak digemari oleh para pecinta kopi. Walaupun kekurangan dalam pembuatan teknik sifon ini adalah di kerumitan dalam proses pembuatan kopinya. Bagi saya, kopi tidak hanya sekedar ‘kopi’ tetapi seni dalam pembuatan kopi itu sendirilah yang membuatnya istimewa. dengan kopi lokal Indo Fei? Gimana rasanya? Apakah ada perbedaan? Hahahha.. I love coffee too..
Coffee, is special to me too. I don’t drink coffee much, but i watch videos on its creation. Its really beautiful. Saya sedang develop beberapa desain produk pengolahan kopi untuk ekspor, didalam negri sendiri sebesar apa ya market untuk produk2 seperti ini? Masih jarang yang pakai buat konsumsi pribadi, bahkan di kafe2 juga tidak semuanya ada untuk sifon. Peluang tetap ada dengan promosi yang tepat 👍😊 harus bener2 pecinta kopi kalo sasarannya perorangan kalo untuk kafe2 msh lbh mudah.. This looks awesome, I’m a #TrueLife coffee ADDICT. Gotta try this! I work as a barista and completely agree 😀 Love coffee its much more than a drink. Plus the latte art is a craft haha Just only got a double tulip. I don’t have idea about making coffee but it makes me alive after drinking it hehe I love coffee so much! interesting content and thanks for also putting up a translation for the english speakers. Oww ic what an interesting job 😉 to do something that you love..
Hahahaha everyone has different styles of making coffee for themselves..
Coffee prepared in syphon coffeemaker is very fascinating to watch. Trung Nguyen in Vietnam uses this type of coffeemaker in some of their coffee preparation. I think Cafe Havana as well except that it is not prepared on your own table. Owww ic.. I’ve never been to Vietnam.. hope to have a change to visit there.. 😁 thanks for reading..
Well, if you like cafes then it would be Trung Nguyen and Highlands. But in Vietnam, you could have a coffee anywhere and get a great-tasting cup. That would be always one of my most favorite places on earth. I love coffee as most of your readers do. Because of health issues I cannot but I may have a cup every once in a while. But even when I was drinking coffee everyday, I only drank one cup of coffee. I was full after one cup but that one cup was important to my morning routine. What do you think about cold coffee. I recently started drinking cold coffee which may be offensive to a true coffee lover. 🙂 Happy New Year! Great blog. Thanks Selvia for your comments! Next Next post: Whole coffee beans or Ground coffee beans?